British bank Barclays has for the first time opened its doors to fresh polytechnic graduates, under a new apprenticeship scheme. Open only to Singaporeans, the poly scheme took in its first batch of 11 apprentices on Monday. The apprentices - from Temasek, Nanyang and Singapore polytechnics - are from a variety of diploma courses such as business and engineering. Barclays is believed to be the first investment bank here to target young diploma holders. It picked the 11 apprentices from more than 300 polytechnic graduates who had applied. They were chosen after a stringent selection process comprising telephone and face-to-face interviews, an exercise to test reasoning and decision-making skills, and a team activity. As full-time employees, they will work in areas such as operations, human resources and finance, and spend two years learning the ropes at two departments. The new scheme comes amid industry efforts to deepen the Singapore talent pool, and develop local financial leaders. Barclays' project lead of the apprenticeship programme, Mr Lim Fang Chien, said the trainees will spend 90 per cent of their time in on-the-job training. Another 5 per cent will be on classroom learning, where they will pick up tips on investment banking, financial products and services, and communication skills. The remaining time will be spent on networking sessions. Nanyang Polytechnic business management graduate Nur Asyiqin Abdul Rahim said she wanted to start work at a company with a "global outlook". "It's a great start for any fresh graduate, especially those from polytechnics, to get into Barclays without any experience," said the 19-year-old, who graduated this year. 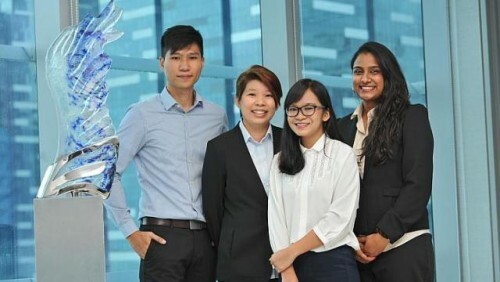 The programme is similar to Barclays' existing recruitment scheme for university graduates, although the latter is open to foreigners and Singaporeans. The bank has taken in 35 university graduates this year. Mr Lim, also the bank's head of learning, leadership and talent for Asia-Pacific, said polytechnic graduates have potential and this was "one segment of talent we've never explored". "Their polytechnic training has made them confident, given them a practical viewpoint of life. Their internships give them a good outlook on the job market." Ms Marianne Lim, Barclays' Asia-Pacific head of human resources for infrastructure, said of the polytechnic graduates: "They have the same drive as their university counterparts to succeed and are just as willing to learn."